We partnered with John Boos to bring you this post. Welcome to Part 4 of our 1912 Modern Farmhouse Kitchen Remodel! We did a complete DIY remodel of our 106-year-old kitchen. Check out our kitchen demolition and our final kitchen remodel reveal. Some of the original elements were still in place like the bead board ceiling, part of the original brick hearth, and a couple of the door casings. We wanted to keep those in place and remodel the kitchen in such a way that the end result would be a blend of historic and contemporary. 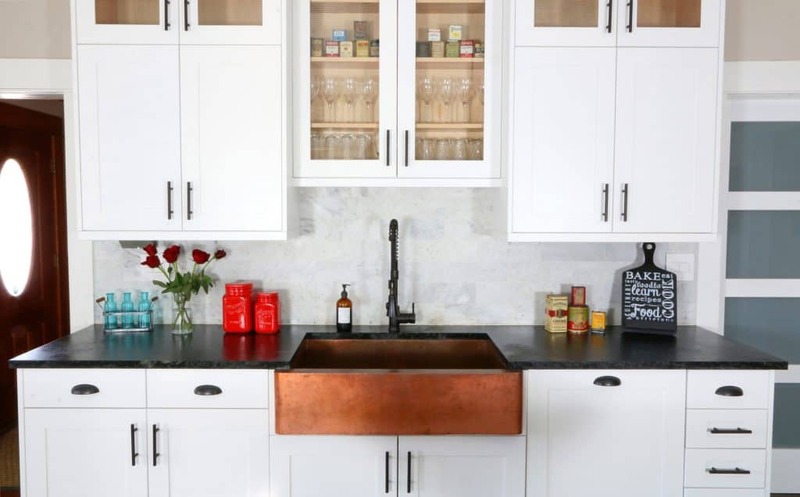 We went with traditional-style cabinets with a contemporary flair and we used traditional materials that would have been correct for the time period of the home, such as soapstone, copper, brick, marble, hardwood and butcher block. 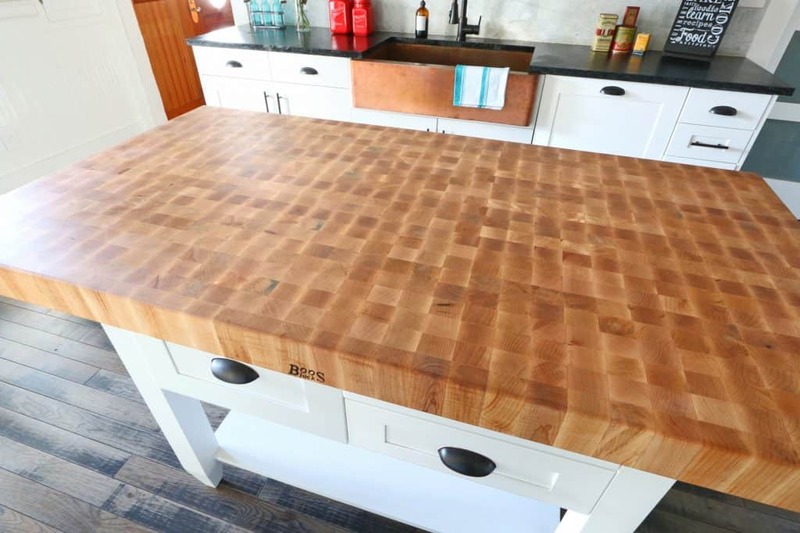 Today we’re going to talk about what is unquestionably our favorite feature of the whole kitchen: Our John Boos butcher block island. One option for the island top would have been soapstone to match our countertops. We quickly dismissed that idea because it would have just been too much “gray” and not enough variation, not only in color but also in materials. As I mentioned above, we specifically wanted a variety and mixture of different materials. We immediately thought of butcher block, which is what we had chosen for the countertops in our guesthouse remodel. We ran the idea by our kitchen designer and he loved the idea, too. 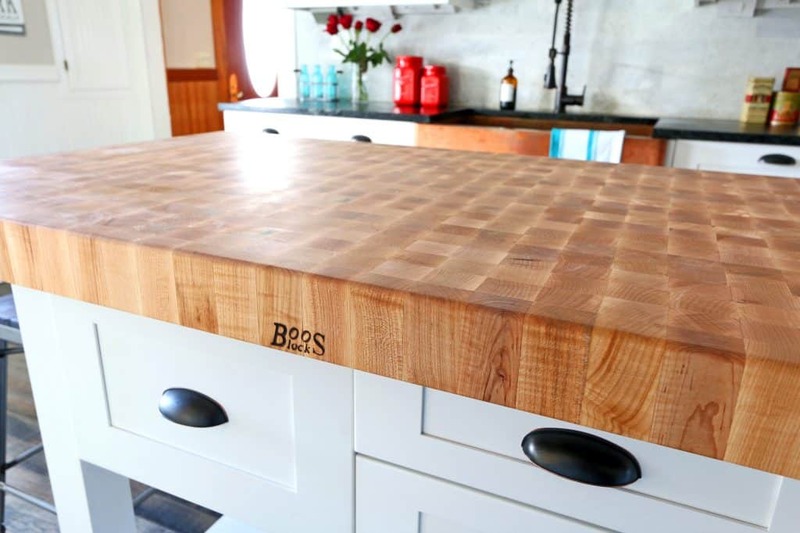 Butcher block has several advantages: It’s gorgeous. It’s traditional and it’s timeless – it will never go out of style. It’s heavy duty. It doesn’t chip, it won’t crack, and as long as it’s taken care of it will last forever. We wanted something that not only had a lot of character and would provide an element of “warmth” to our kitchen, but something that was also highly durable. After all, it would not only be a daily a gathering place for our kids but also the workhorse of the kitchen. 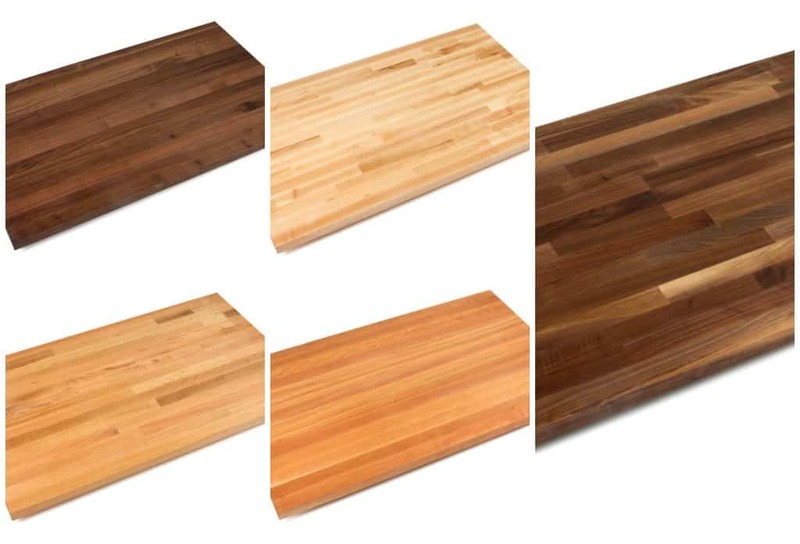 It took us all of 5 minutes of online research to determine what is unanimously the #1 recommended butcher block manufacturer in America: John Boos. Sold in the most reputable kitchen stores across the country, John Boos’ tagline sums it up: “The Trusted Tradition for the World’s Finest Kitchens” since 1887. 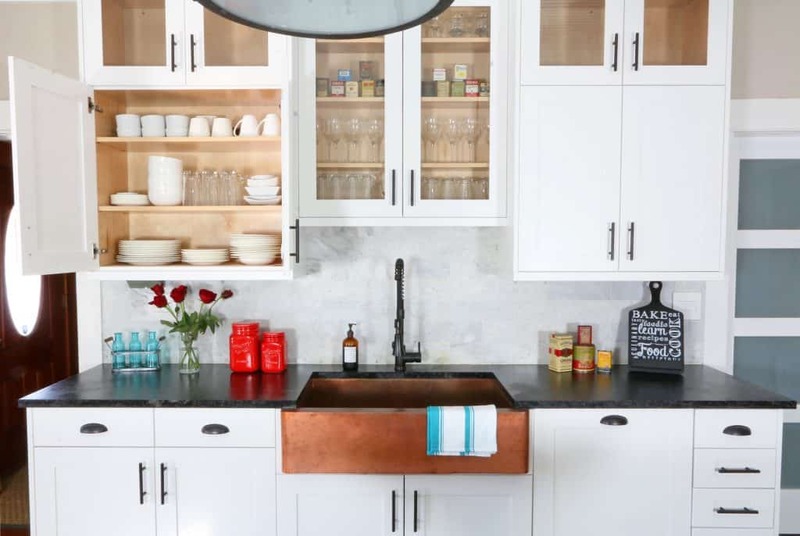 They make a variety of products including cutting boards, butcher blocks, countertops, islands, tables, and also stainless steel tops, racks and shelves. All of John Boos’ products are proudly made in the USA in Effingham, IL. John Boos’ cutting boards and butcher blocks are favored among many of the world’s top chefs for their quality, beauty and durability. Quite simply, John Boos is the gold standard. Quality is something my husband and I greatly appreciate and it’s always at the foundation of our purchase decisions. Quality not only provides the most satisfying experience in the interim, but buying quality in the first place also saves money in the long run. We wanted the highest quality butcher block possible for our kitchen and we found it in John Boos. 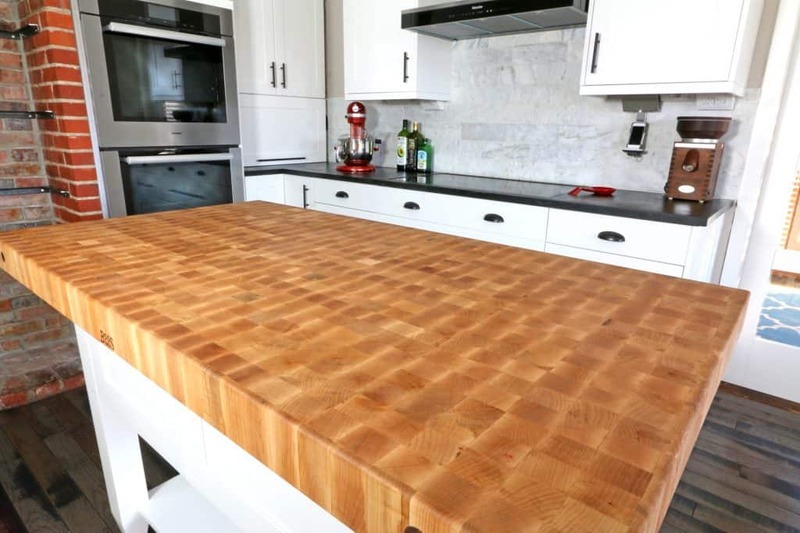 HOW TO CHOOSE BUTCHER BLOCK? This really comes down to personal preference but different woods have different qualities. For example, some are harder, some are softer, some are gentler on the knife’s edge, and then of course there is the aspect of aesthetics – different woods have different grain patterns and colors. Some of the options at John Boos include maple, cherry, walnut, oak, and a variety of blends. John Boos cutting boards and butcher blocks are specifically certified for food use by the National Sanitation Foundation (NSF). Though it may seem counterintuitive, these woods are safe options for inhibiting bacterial growth around food, using capillary action to absorb bad bugs from the pores of the cutting surface. And cleaning the boards is a breeze. And then comes the choice of edge grain or end grain (the pics above are edge grain and the pics below are end grain). We chose an end grain butcher block in hard rock maple, aka sugar maple (bottom left). Hard rock maple is not only a very attractive wood, it’s also valued for being resistant to shock and damage (it’s a popular choice for baseball bats and rolling pins). It’s also a reliable and renewable resource found in abundance in the U.S. and Canada. It not only is slightly cheaper than walnut and cherry, it is also the hardest of all the woods and for that reason helps maintain the edges of knives better. We also wanted to go with a lighter wood color to provide contrast to our dark countertops. In comparing edge grain and end grain, end grain dulls the knife’s edge the least and it is the top choice among professionals. The end grain fibers do two things: They absorb the impact of the knife blade which allows your edge to stay sharper, and it also keeps the cutting board surface smoother. End grain is what you envision as the traditional butcher block and it really lets the fine workmanship shine through. The helpful staff at John Boos was very helpful in answering our questions and helping us identify the best option for our specific needs. Then there’s the choice of getting a finish on the butcher block or leaving it natural. John Boos makes a special smooth, semi-gloss Varnique Finish that is more resistant to staining and water spotting and it’s used for aesthetic purposes for individuals who don’t plan to cut on the surface (any cutting will damage the finish, though it can be repaired). The other choice is the Natural Penetrating Oil Finish. It’s a natural oil finish that seals and protects the surface and is safe to cut on. For maintenance, you just need a quick minute to re-oil the surface every 3-4 weeks with food-grade mineral oil. While it does require the regular re-oiling, an advantage is that it can be regularly sanded and re-oiled for a “like new” appearance. We chose the Natural Penetrating Oil Finish. WHAT ABOUT UPKEEP, STAINS, SMELLS, SANITIZATION, ETC? No problem! We’ve been using our Boos Block multiple times a day for the past several months and keeping it looking nice and smelling clean has been no problem at all. John Boos has a FAQ section that addresses all of these questions and more. By following the simple care & maintenance guidelines, these butcher blocks will last a lifetime and beyond. I’ll repeat what I said in the beginning, namely our favorite feature in our kitchen is our John Boos butcher block island. We absolutely LOVE it and consistently get compliments on it every time people come over to visit. It serves as a casual gathering place for our family, it’s where our kids do their work and draw and color and play with Play-Doh while I’m doing other things in the kitchen. It’s where my kids sit to help me cook. It’s where I do most of my food prep. It’s where I lay out dishes and platters of hors d’oeuvres for entertaining friends and family. It’s where my husband pulls up a barstool to keep me company while I’m working on a late night cooking project. Our John Boos butcher block has become a central part of our family’s daily living and we look forward to a lifetime of use! For more information visit John Boos. A special thank you to John Boos for being a central part of our kitchen remodel! 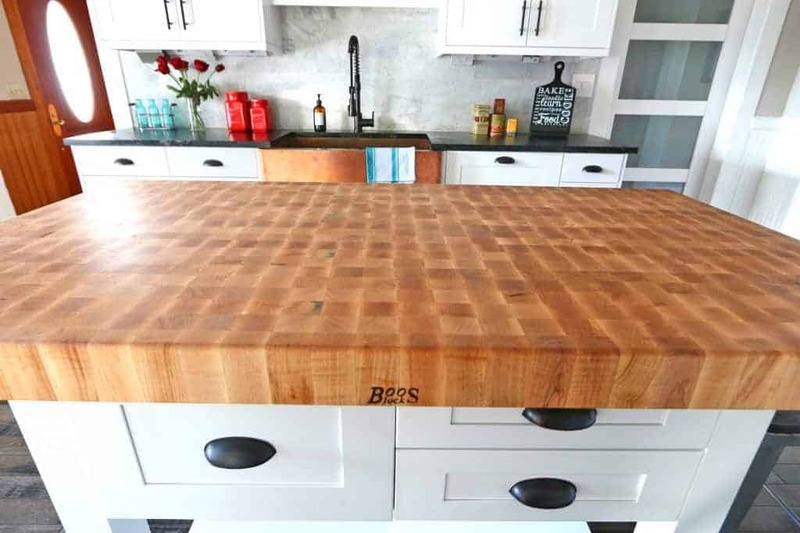 I just love the Boos boards and I bet having an whole kitchen island made from them is AMAZING! I love it! It’s just perfect. I never heard of Boos boards before and that island turned out gorgeous! Love the whole kitchen…you all did an amazing job!! This is jaw-droppingly STUNNING! I can’t tell you how much I LOVE your Boos kitchen island (and everything else about your kitchen), it is just beautiful! Beautiful! I have always loved butcher block. Thank you for this informative post and the introduction to John Boos. I shared this with my husband and you have given us a lot to think about for our upcoming kitchen overhaul. Congrats on your new kitchen, you did such a great job and it’s beautiful! I “inherited” a Boos cutting board from a friend a few years ago. I use it almost daily and keep it oiled. It’s still going strong and I expect to get many more years out of it. You did a truly remarkable job on your kitchen. Your new kitchen looks really great! Absolutely gorgeous! This is my dream countertop!! OMG I think I may move in! Lol just kidding of course, but man, that is one STUNNING island countertop!! I have been following your remodel. I am loving everything you are doing! You definitely have an eye for detail. This all looks beautiful. I love my Boos boards. This island top is incredible. I would love to have a kitchen like yours! wow! stunning! love this look! So jealous of your kitchen! We are redoing ours right now and this got me all anxious to have ours done! Your kitchen is stunning, Kimberly!! I love, LOVE the Boos butcher block and all of your other choices, well done! I want to move in with you. Since that’s not an option I need to have an island made like yours. Gorgeous!!! What a gorgeous island! I’m about the pull the trigger on a brand new island myself. So exciting! !